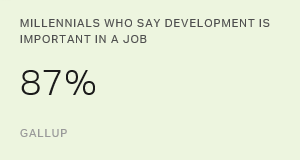 Millennials desire opportunities to learn and grow in their jobs -- but they're struggling to find ones they think are worthwhile. Large organizations tend to have lower employee engagement levels than small businesses. How does employee engagement move through an organization? Does it begin in the executive suite and move down through managers to frontline workers? Or does it come from all different directions? Gallup researchers set out to tackle these essential leadership questions. As baby boomers age, managing older workers has become an issue, just as leading younger employees was in the 1990s. But when it comes to engagement with their jobs, it may not be the oldest nor the youngest who are most at risk. Companies can reduce costly churn if managers know what to look for. But they usually don't -- and that's because too many managers think money is at the root of the turnover issue. This article uncovers the real sources of the problem and reveals the reasons most people quit. Find out how to keep good employees from walking out the door. When Gallup analyzed high-performing workgroups to understand what drives their success, one of the dozen elements that emerged as most important was the statement "This last year, I have had opportunities at work to learn and grow." Decades of research reveals that employees give more of themselves when they feel a sense of progress rather than feeling stagnant, according to the authors of 12: The Elements of Great Managing. The young manager of a home improvement store in Wales excels by giving his employees opportunities at work to learn and grow. In fact, he does this so well that he has become one of the most successful managers at it in Gallup's worldwide database. Already an esteemed hospital with a high-performing staff, Medical City Dallas wanted to improve the engagement of its employees. Its leaders were determined to uncover problems and identify deficiencies -- and to correct them. This effort has meant a lot to the hospital's health -- and especially to two extraordinary patients. It's widely believed that those who get ahead in office politics must be dupes, stooges, or yes-people. But the reality is quite different. Gallup has found that among the most successful organizations, many people who get ahead are solid performers and highly effective in their roles. What's their secret? They use their innate talents to rise through the ranks -- and to master the politics of their workplaces. Some managers inspire excellence. Some inspire loyalty. But a very few, such as Diane Marinacci at the federal General Services Administration, inspire people to the highest quality of work, the sincerest forms of loyalty, and passionate engagement. Find out what makes Marinacci so special, and successful. As more Thai firms try to compete in the global market, they learn that the quality of their people is critical to winning business. Those firms often start by asking "How do we select talented employees?" But a smarter question would be "How can we keep our talented employees?" -- because the financial implications of losing a single talented worker are enormous. Many people start the year making resolutions about how to improve their life, at home and work. But often, making real improvements seems out of reach. Why is it so difficult to improve? Here are some strategies for using your talents to make resolutions realities in 2002. Customer loyalty is at the core of the "value creation" proposition. High loyalty scores bode well for future growth. But what exactly is customer loyalty? How does loyalty relate to engaging customers? And what role does your sales force play in generating customer loyalty and engagement? Positive feedback from managers and co-workers is essential to most employees. Without it, even hardened stoics tend to lose heart and question their actions and goals. Managers can jump-start the discussion about what encourages their team members, and ways team members can encourage others. The language of strengths is most powerful as the basis for insight and understanding shared across entire organizations. It can help individuals and teams become increasingly more effective. But at first, using a new language is awkward. How can managers and leaders facilitate the use of strengths talk? If you want to reveal your talents, monitor your spontaneous, top-of-mind reactions to the situations you encounter. These top-of-mind reactions provide the best trace of your talents. They reveal the location of strong mental connections. Gallup's "language of strengths" fosters the perception of talent in oneself and others and facilitates articulation and further expression of those talents. Gallup's strengths management framework breaks the types of talent down into 34 distinct "themes." The need to learn and grow is a natural instinct for human beings. We can learn and grow by finding more efficient ways to do our jobs. Where there is growth, there is innovation, and this is a breeding ground for more positive and refreshing perspectives toward ourselves and others.